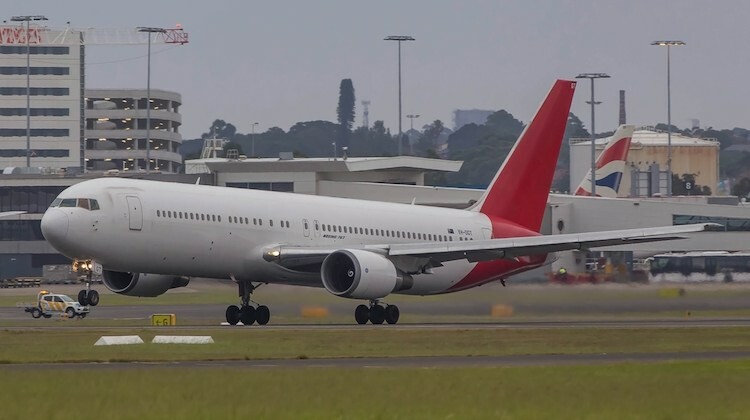 Retired Qantas 767-300ER VH-OGT has departed Sydney for Alice Springs where it will enter storage at the new Asia Pacific Aircraft Storage facility there. VH-OGT was one of five 767s operating on the type’s final day of passenger service with Qantas on Saturday December 27, operating QF422 from Melbourne to Sydney. The 767, one of the youngest in the Qantas fleet having been delivered in July 1998, departed Sydney for Alice Springs at 7:16am on Friday. Do we know why this aircraft is going to Alice? Future conversion into a -300ER freighter for Qantas Freight or? Maybe these planes will eventually be leased out to other airlines just like the 4 ex Qantas 767s being leased to Canadian airline Westjet. Makes sense to store the 767″s at Alice, only 3 hours flight from BNE, compared to 16 including 1 stop, to the U.S.A. great fuel and crew savings. Sales and modifications could be Australian based, a new industry perhaps. Would be great if @ Aus Aviation could do a profile story, print or even online edition dedicated to aircraft boneyards, including the now expanding Alice Springs facility. The November 2014 edition of Australian Aviation magazine has a story about the Asia Pacific Aircraft Storage facility at Alice Springs Airport.